Jakarta (VNA) – The Indonesian Democratic Party of Struggle (PDI-P) will continue supporting Indonesia-Vietnam strategic partnership toward new achievements, said the party’s President Megawati Sukarnoputri. She made the remark when meeting with Party General Secretary Nguyen Phu Trong, who is in an official visit to Indonesia at the invitation of President Joko Widodo, at her private home in Jakarta on August 23. General Secretary Trong told his host about outcomes of his meetings with President Joko Widodo and other leaders of Indonesia, during which the two sides reached high consensus on the policy to deepen the bilateral strategic partnership and measures to bolster the ties across bilateral and multilateral cooperation spheres. The party chief urged both countries to work harder to implement agreements secured by high-ranking officials and sustain the momentum they have created for the development of their relationship in all fields. He stressed that the Communist Party of Vietnam values and wants to expand affiliations with the PDI-P, adding that it is an important political basis to boost relations between Vietnam and Indonesia. For her part, Megawati Sukarnoputri said her party will continue to give priority to boosting relations with Vietnam and effectively implementing agreements secured during the Vietnamese Party leader’s current visit. 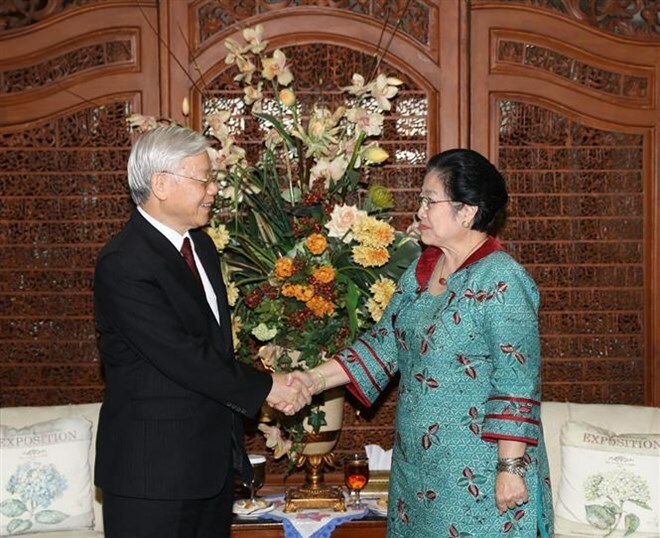 She agreed with her guest on measures to boost cooperation between the two parties and expressed her wish to send more PDI-P delegations to Vietnam for experience exchanges on governance of the country.